I dunno how old my oldest bottle of OPI is but it’s old. Definitely over 23 years old (as we learned last week). Since then, we’ve seen changes in formula, brush, finishes and textures. Infinite Shine is one of the latest “revolutions.” When combined with the Infinite Shine Base coat, Gloss top coat, and proper application, it’s a high-shine, long-ish lasting nail polish. Do I use it as a long wear? Nope. Do I like the colours? Yep. Do I like the formulas? Uh… sometimes. 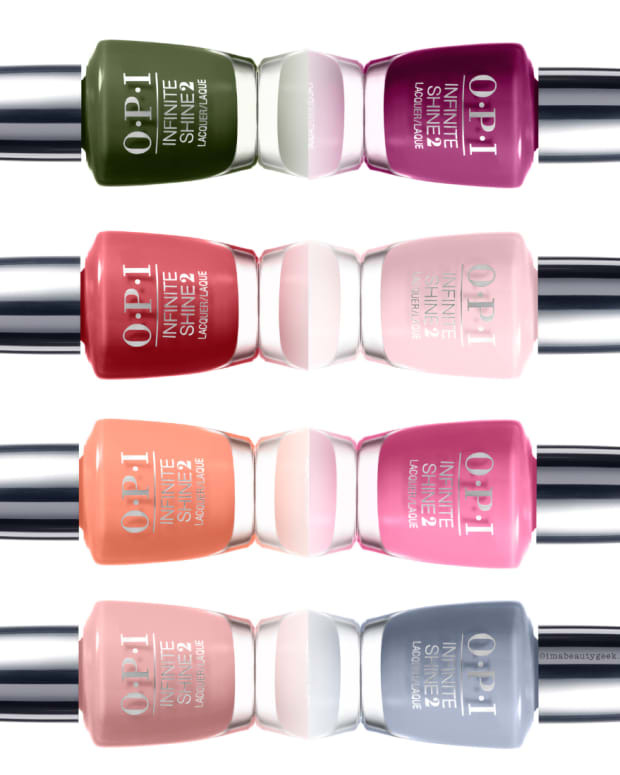 OPI You’re Blushing Again – Infinite Shine Summer 2015 (above). You’re lookin’ at two coats of this peachy latte neutral. The polish is a thick crème and the level in there is pretty swell – it’s good. 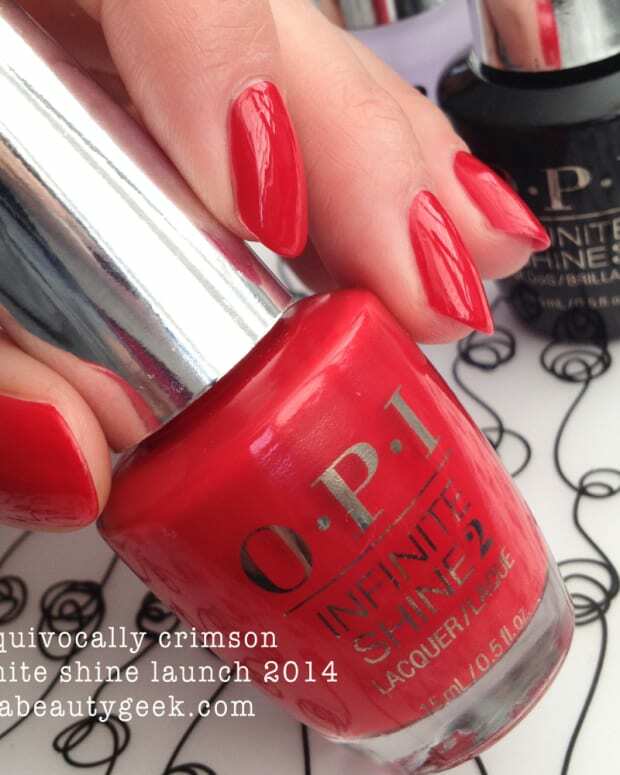 OPI Patience Pays Off – Infinite Shine 2015 (above). That’s two normal coats. You’re going to put the second coat on and think it’s not going to level. It will. Just wait. If you try to do thick coats, you’re going to end up with teeny tiny bubbles. Don’t use thick coats, k? Also, my Gloss (top coat) brush made some nice drag marks (visible on ring finger). I don’t know if that’s because my Infinite Shine Gloss coat has been used so much or because it hasn’t been used in a few months. 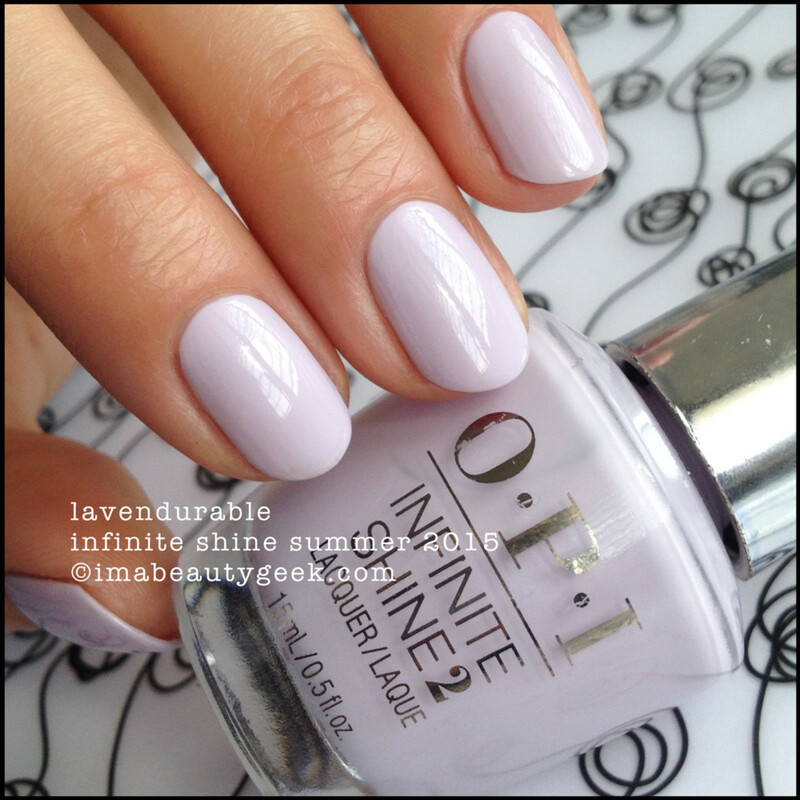 OPI Lavendurable – Infinite Shine Summer 2015 (above). Huh. Awfully similar to Patience Pays Off, right? Similar, but not the same. Anyhow, the brush on my Lavendurable was a little tiny bit uneven. An uneven brush makes me crazy. I don’t like to have to work to get a clean line at the cuticle. An uneven brush = work. Not only does it equal work, it equals streaks and dragging because the pressure distribution on the bristle edges is uneven. But the colour here is so lovely. I’d scrap with this brush again just because I love the shade. You’re gonna check your brush before you buy, yes? 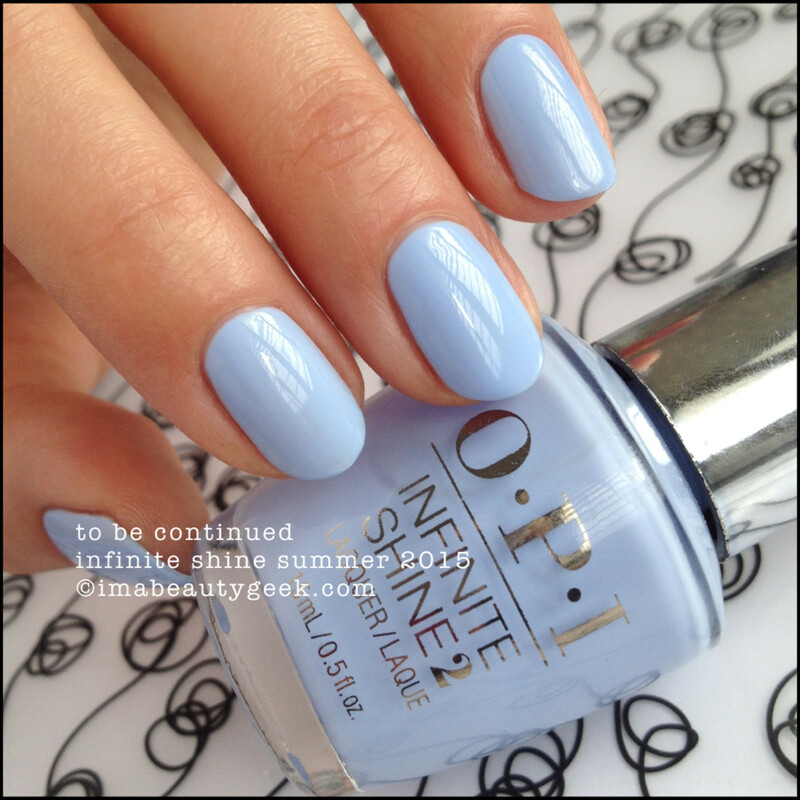 OPI To Be Continued – Infinite Shine Summer 2015 (above). I’m not sure if the brush in this was a little bit uneven or if it was just a little too inflexible but I found this shade just a wee bit finicky. Don’t care though because I love this colour. It took two very gentle and very even coats to get what you see up there. Now that I know how to work it, I’m totally going to sport it. I.love.this.colour. 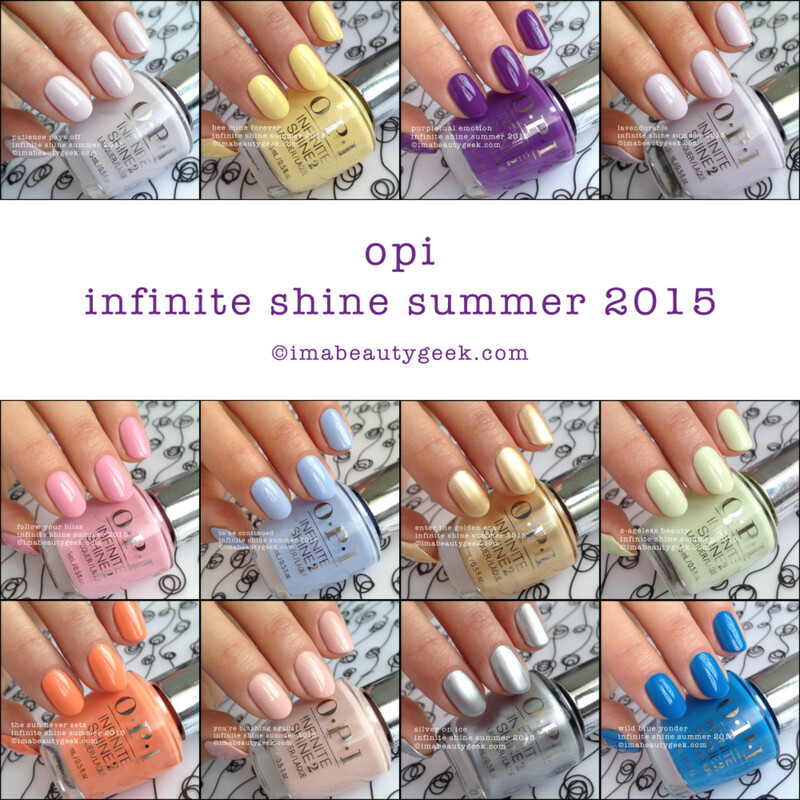 OPI Bee Mine Forever – OPI Infinite Shine Summer 2015 (above). How about that for a beautiful buttery pastel yellow, huh? That’s two coats and I’ve decided it’s the brushes that are making the streaks. They’re cut almost invisibly uneven and you can see what I mean by uneven if you look at the cuticle line here – it’s not perfect. Grrrr. 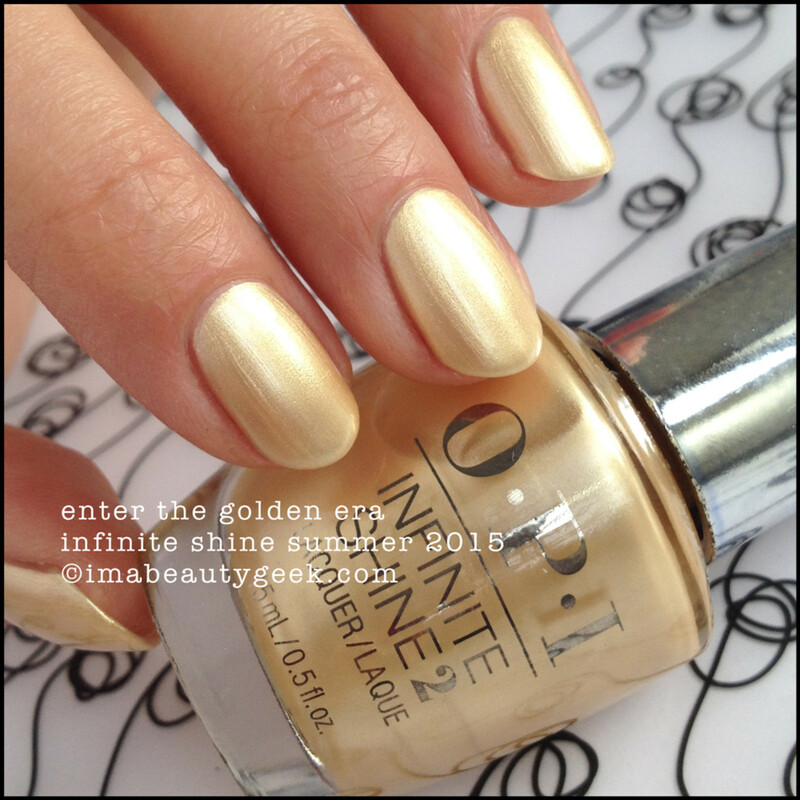 OPI Enter the Golden Era – Infinite Shine Summer 2015 (above). I wanted this to be a one-coat-wonder but it wasn’t. I also wanted the streaks to dry down more, but they didn’t. It’s kind of a decent shade of bright champagne gold so if you can handle the streaks, it might be for you. It ain’t for me though. 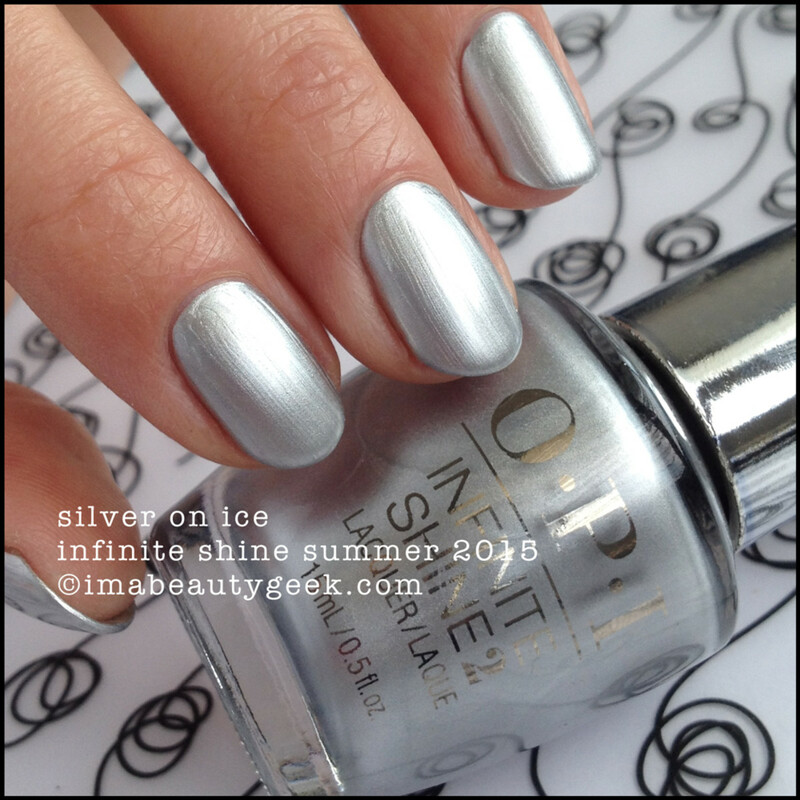 OPI Silver on Ice – Infinite Shine Summer 2015 (above). That’s a single streaktastical coat, friends. I’m just going to tell you to pass on this one. There are better silver shades out there – you know it and I know it. Sorry OPI. Fail. OPI Follow Your Bliss – Infinite Shine Summer 2015 (above). This was my fifth swatch in the session. I don’t know if it’s the brushes or maybe I’ve had too much coffee today but I swear I’m getting slight streaks. They seem to be leveling out okay, but perfectionist as I am, it’s buggin’ me. That’s two coats and you can barely see the streaks on the left side of my index. It’s not enough to notice in real life, but yeah... irritated now. OPI The Sun Never Sets – Infinite Shine Summer 2015 (above). Lookit that cantaloupey shade of orange! Holy ballz it’s great! Again, two coats but the first was thin and the second was a big blob (but not too big otherwise you’ll have trouble controlling it). Do as few strokes as possible – ideally 3 or 4 and a quick cap. Don’t mess around. Yep, it’s another finicky polish that needs finesse. OPI Purpletual Emotion – OPI Infinite Shine Summer 2015 (above). OMSqueeee!!! Seriously easy to apply and seriously shiney even without the top coat. This is the shade everyone will want. It’s good to know the formula is as outstanding as the colour, right? 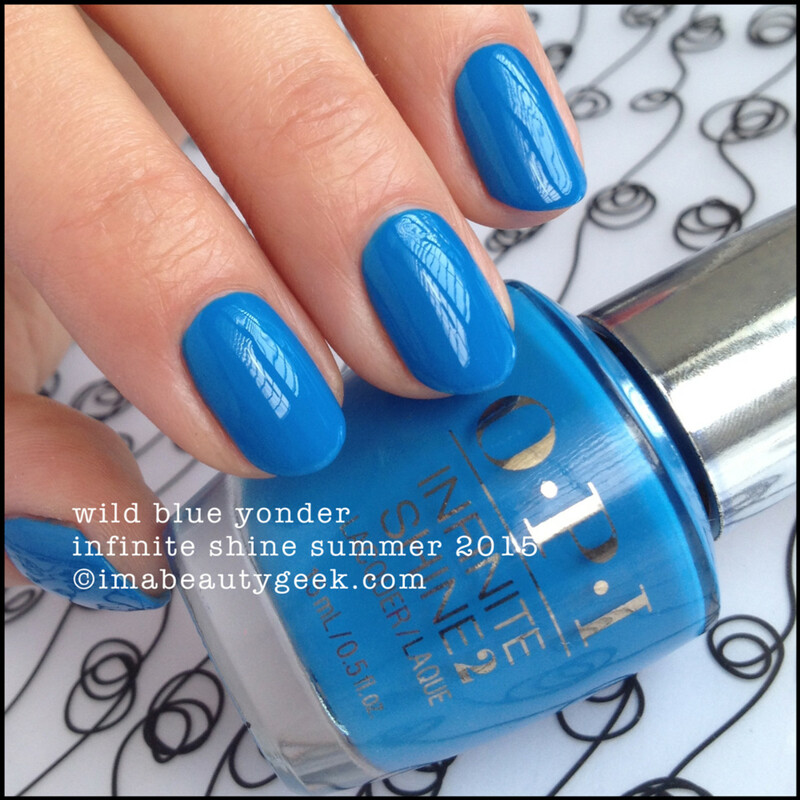 OPI Wild Blue Yonder – OPI Infinite Shine Summer 2015 (above). Dude! This was SO close to being a OCW!! But it wasn’t. You’re going to need two coats. It won’t work in one big fat coat. I know because I tried, a couple times. Who cares if it’s two coats though? I’m head over heels in The Love. 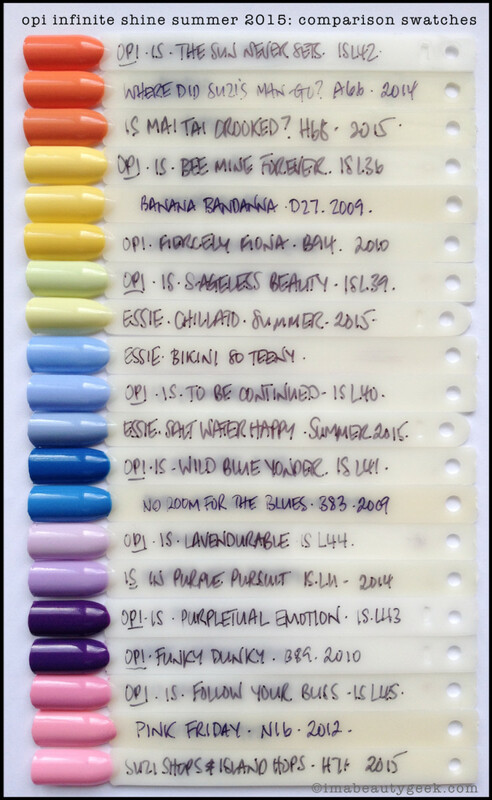 Generally, this collection goes on in two coats. Generally, you’ll want to lay the second coat down on the first coat very gently while maximizing the amount of brush touching the nail (to reduce drag marks from the brush edge). If you can get it on there gently, you’ll have really beautiful results. These new polymers and plasticizers require slight adjustments in the way we polish, so if you find you’re dragging, just adjust the angle a little and you should be good to go. It’s not the same as using regular OPI. It’s really not. You’ll also want to use these in conjunction with the OPI Infinite Shine Gloss coat to give yourself added shine and added wear time. Do you neeeeeed to use it? Nope. Is it better if you do? Yep. Can you use a different top coat? Sure. Will your results be the same? Maybe. For the comparisons, if there’s no brand name on the stick, it’s OPI. If it says OPI IS, it’s an OPI Inifinite Shine. If you need to get closer or if there’s sumthin’ else you think might be similar, holla and if I have the stick, I’ll take the pic (unless you’re crazy wrong – then I’ll just tell you you’re crazy wrong). 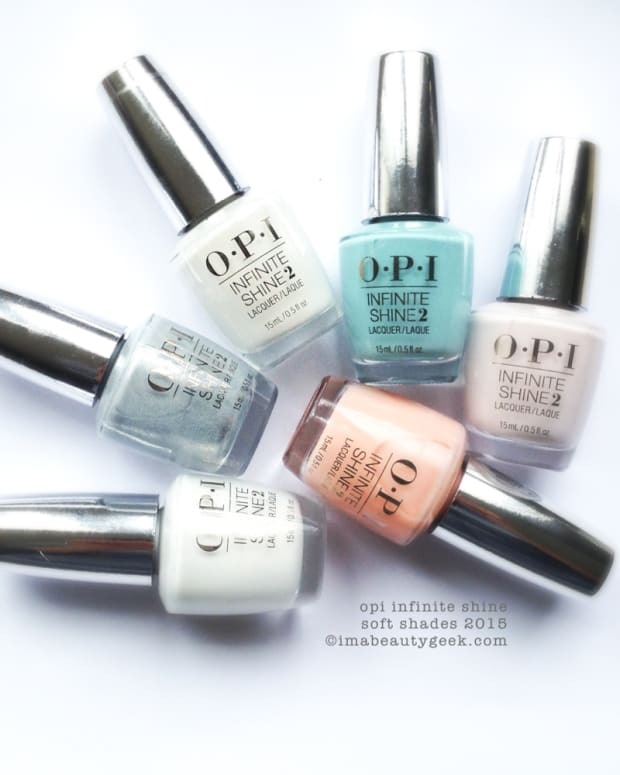 OPI Infinite Shine Summer 2015 lands on counter in July and will be available at places like Ulta.com and TradeSecrets.ca. Oh – and links to our swatches & reviews of recent things: OPI Brights 2015, OPI Soft Shades 2015, OPI Infinite Shine Soft Shades 2015, OPI Venice F/W 2015, and the crazy popular OPI Hawaii 2015. Manicures and photographs Karen Falcon (she has a dedicated OPI Infinite Shine Pinterest board).